Yesterday Mother Nature slapped us again for being disrespectful. We had been getting a fair amount of rain for the better part of the week, so the ground had soaked up about as much as it cared to. Then Tuesday night about 8 pm the skies opened up and we ended up getting something close to 8 inches in a few hours. We live in what is called the Endless Mountains region of North East Pennsylvania, which is best described as mostly a ridge and hollow type landscape. We are up on top of a huge hill, and most of the houses around here are up out of the flood plains, so when we get rain events like this we don't worry much about our houses standing in flood water like the valley cities (Wilkes-Barre, Scranton) do. Where we run into trouble is that all the water gets funneled into very narrow and often steep places which makes it run fast and deep. 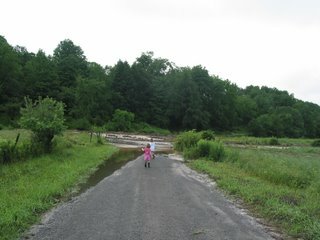 The Whites Creek which runs a mile to the west of the farm is usually about 15 feet wide and a foot or so deep. When I checked it yesterday morning it had spilled over it's banks and had covered most of the creek flats that are down there. 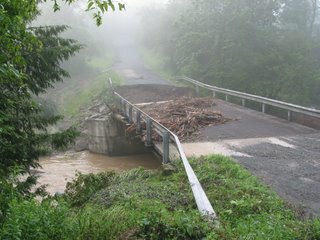 Three of the roads that cross that creek, each within about a mile of each other had their bridges destroyed. One of the problems we are having in this part of the state is that there are a lot of bridges closed for repair and not a lot of money to fix them. 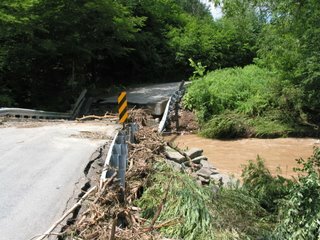 Bridges that are closed often stay that way for 5 years until the state gets around to repair them. I hope they will be able to repair some of these bridges faster than that. Our Springville Township road crew is pretty impressive though. The township road that runs along the creek was largely covered up with debris and stone that had washed down our hill and dumped onto the road. 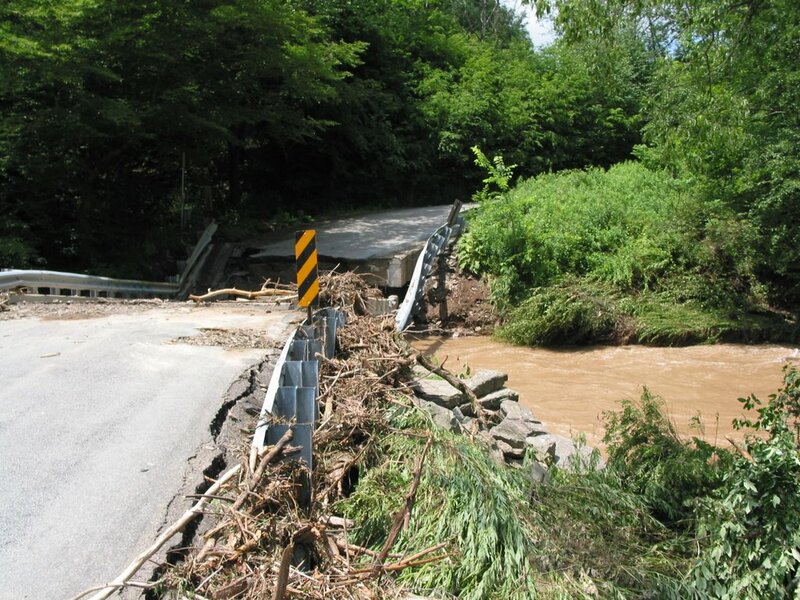 By the middle of the afternoon they had managed to make that road passable, and the bridge that they built last year was the only one that I know of that survived. A while back I had a post about frost seeding clover into some of our pastures. Today while I was moving the cows to a fresh paddock I began looking for signs that some of the seed found a home. 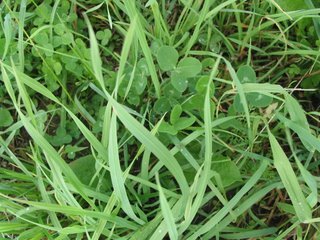 Just about every bare spot between clumps of grass was inhabited by young clover plants. 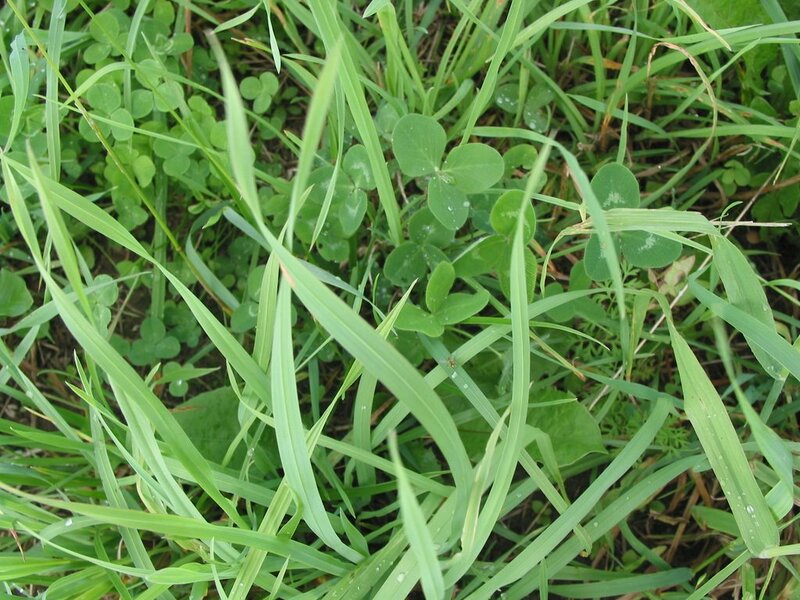 This clover will increase the protein content of the pastures as well as fixing a good amount of nitrogen in the soil, which will benefit the growth of the rest of the plants in the pasture. We are not able to get quite enough nitrogen into out fields otherwise. This becomes obvious when I see how much greener and more quickly the grass grows after the chicken pens pass over a section of the field. It ends up looking like a green racing stripe. 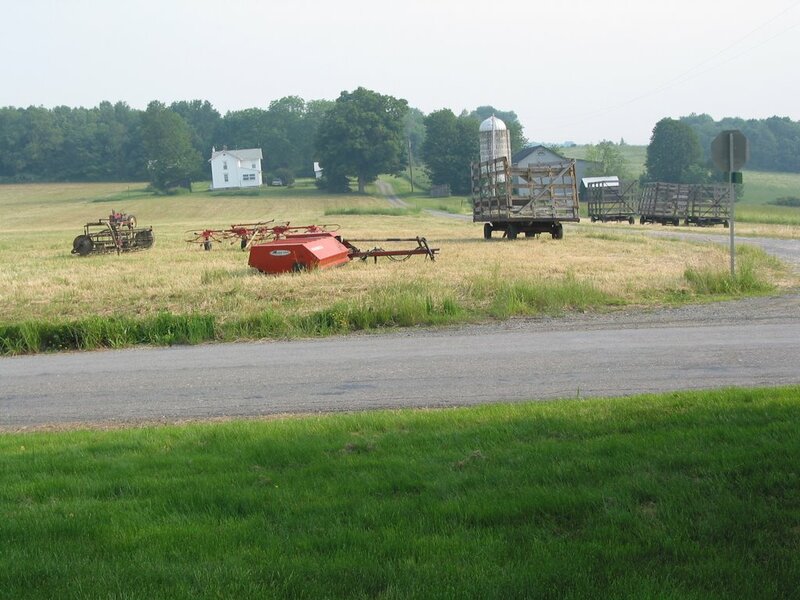 We rent the farm across the road primarily to make hay on. With all of the machinery involved making hay over there has always seemed like a military invasion. I usually establish a beach head in the field right across the road, and from there we push further and further into the fields until we have conquered the whole farm. This afternoon I plan to take the hill. By the time we are done with hay the fields are all bare and the machines occupy the top of the hill. I am not sure why I tend to think of these things in militaristic terms, because ultimately I am pretty much a pacifist. 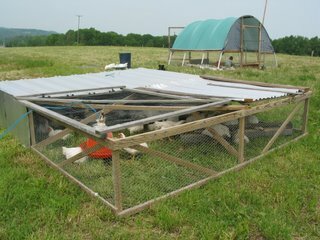 I have been trying to come up with a broiler chicken field pen design that would work better for me than the Salatin type pen (Joel Salatin is the Guru of modern pastured poultry). His style of pens (bottom picture) are 10x12 and 2 feet high. We have been using this design for the past 5 years or so. The nice thing about them is that they are quick to build and have a low profile, which helps them blend into the landscape and keeps them from blowing away in wind storms. What I dislike about them is that they are hard to get the chickens back out of when their time comes. Also there are times when we have too much rain for the ground to absorb and water starts to run into the pens. If these chickens can't get dry because they are sitting in a puddle they get hypothermia, and that's it for them. More than once I have been out in a torrential downpour at some wee hour of the morning trying to spread hay out under the covered part of these pens. 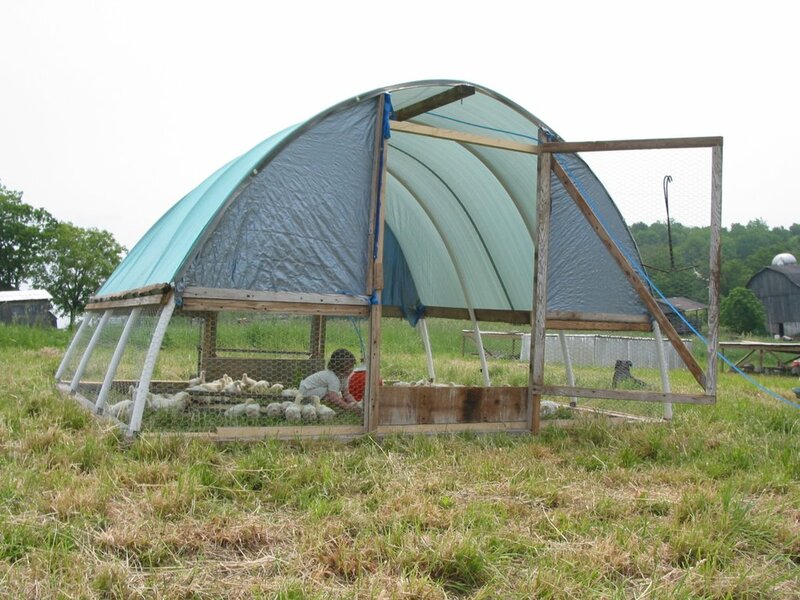 The hay lets the chickens get up out of the water and they soon dry off. 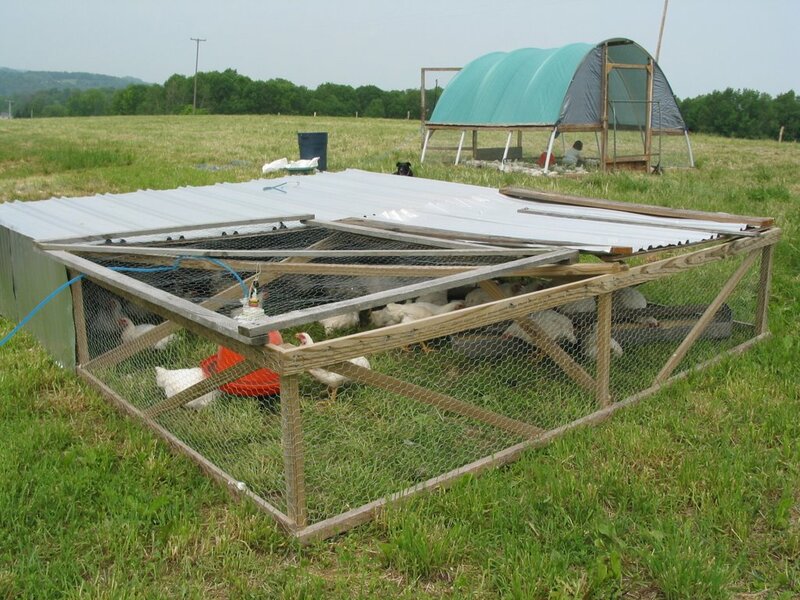 Another trouble is that it is hard to see if the chickens are out of the way of the trailing edge of the pen or the dolly it rolls on, which makes moving the pens a little nerve wracking. 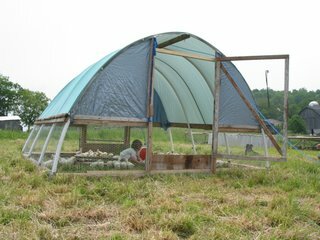 I built at similar shelter to the new pen last year for the turkeys. The fatal flaw on the turkey tunnel was that I didn't enclose the ends at all, which apparently made it close enough in design to a hang glider, and it took off in an October thunder storm (see archives). The turkey tunnel hoops were made out of steel rebar which made them remember every way they had ever been mistreated. The final insult was about 8 inches of wet snow which flattened it beyond repair.